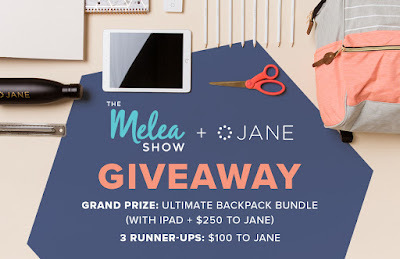 Enter the Melea Show Giveaway from Jane.com for a chance to win an ultimate backpack bundle that includes a 32GB iPad, school supplies and $250 Jane.com credit. There will be three additional winners of $100 Jane gift cards. Entry is a super easy giveaway form. Sweepstakes ends today, August 5th. Good luck and be sure to let me know if you win!